Laboratory syringes are intended for safe and reliable liquid distribution, the selection of pistol-grip and two-ring instruments comes in a wide volume range. 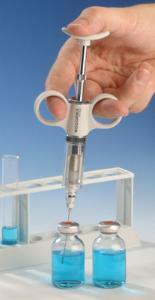 Dosys™ 162 basic syringes are fill-by-fill (automatic) through needle or cannula, with luer lock nozzle. 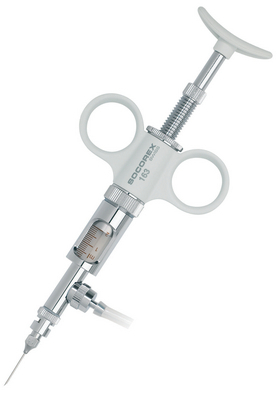 Dosys™ 163 classic syringes are self-refilling automatic, with integrated valve system and luer lock nozzle. Dosys™ 164 premium syringes are self-refilling automatic, with detachable valve system, enhanced corrosion resistance and luer lock nozzle. Fornecimento: Dosys™ 162 basic package includes syringe, PVC protection sleeve and operating instructions. Dosys™ 163 classic package includes syringe, one-meter silicone feed tube, sinker, PVC protection sleeve, aspiration and vent cannulas, set of spares for valve, operating instructions. Dosys™ 164 premium package includes syringe, one-meter silicone feed tube, sinker, PVC protection sleeve, aspiration, vent and dosing cannulas, set of spares for valve, operating instructions.